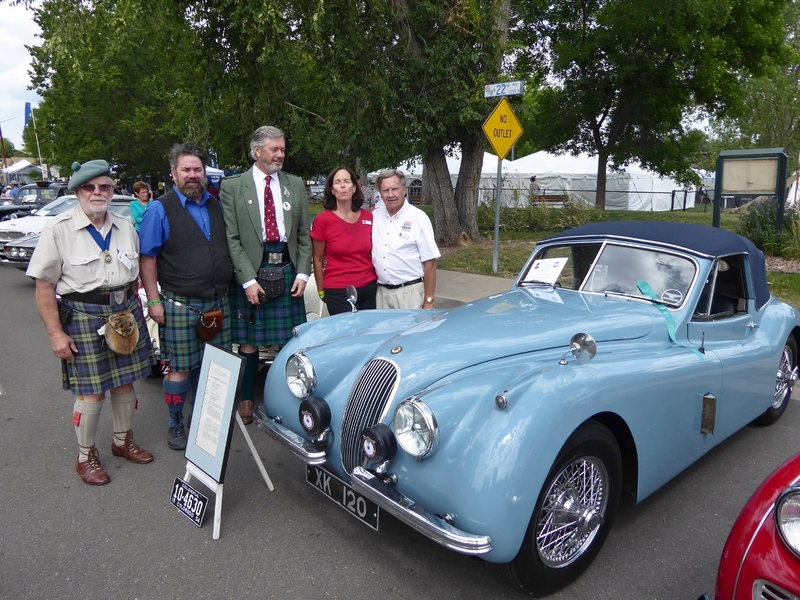 Video of the British Cars display at the 55th Annual Scottish Festival held in Edgewater, Colorado on Sunday August 5th, 2018. Note the sounds of sword fighting and bagpipes in the background. 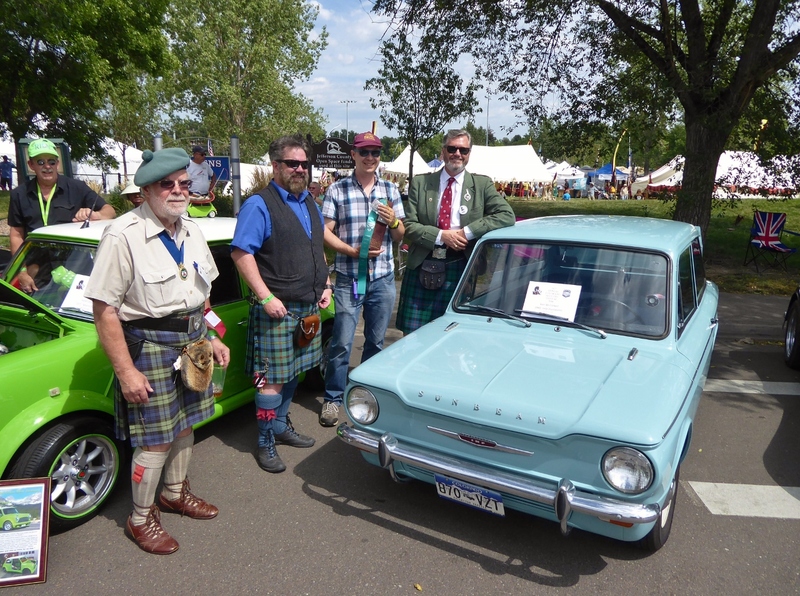 Pictures include Ken McCorkell and his 1965 Sunbeam Imp which won the Chieftain’s Choice Award. The Imp was made by the Rootes Group/ Chrysler in their Linwood, Scotland factory. 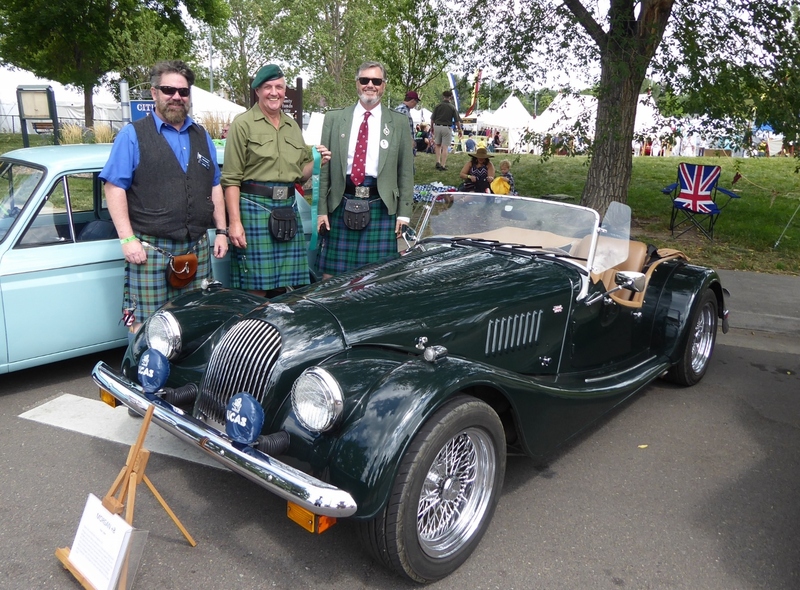 Honorable Mention Awards went to Jim and Cindy Hegy for their 1954 XK120 Drop Head Coupe and Bruce Marshall for his 1994 Morgan Plus 8. 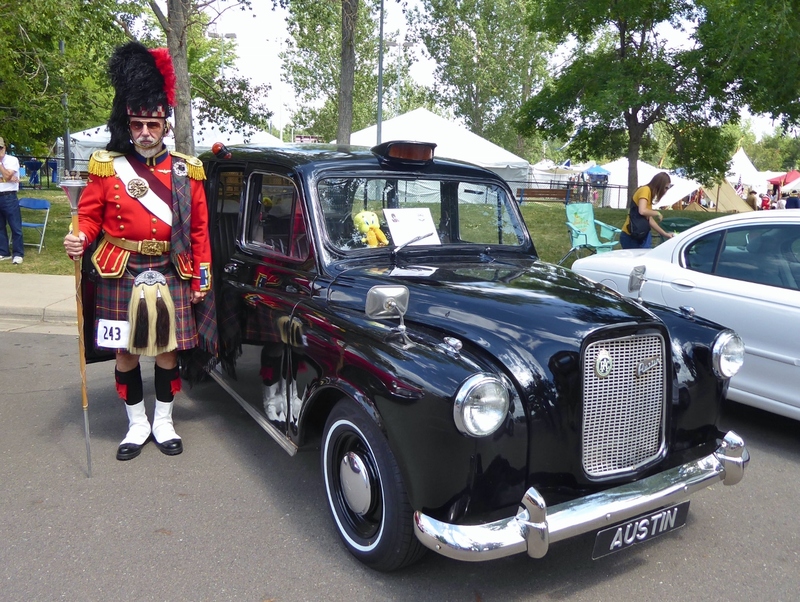 Viscount Morrison admired the lines of Karl Johnson’s Jaguar Mk 2 3.8 and a Drum Major adds his presence to Cathy and Joe Gunderson’s 1967 Austin Taxi. 6pm to order from the menu. Find them at the bottom of the Glenwood Rallye 2018 page under “Results”. Also I am leaving town for the next month so I’ll be out of email contact until July but Jack and Cathy are happy to answer questions. Drive from Denver to Salida: We’ll do afternoon activities and have dinner in town either on our own or as a group. double queen a rate of $101.99 and again, a pet or want a balcony it is $10 more ($111.99). Plans beyond the 24th are TBD but wanted to get a head start on our planning now. For anyone not wanting to go all the way home from Santa Fe on September 25, we will be making a stop overnight in Salida at the Silver Ridge Lodge. Please make your reservations at 877-268-3320. It will be $79 plus tax for a single queen bed and $89 plus tax for 2 queen beds. Cheers darlings, I’ll see you all in July!!! 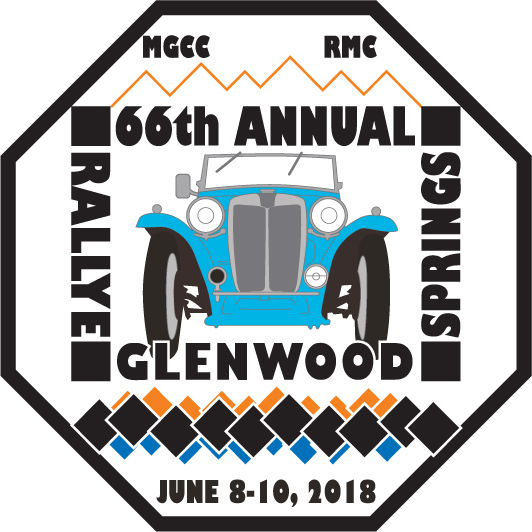 Please join us for the MG Car Club, Rocky Mountain Centre’s premier event: Rallye Glenwood Springs. This is the 66th annual Rallye Glenwood Springs, oldest continually-held time-speed- distance rally in the United States. 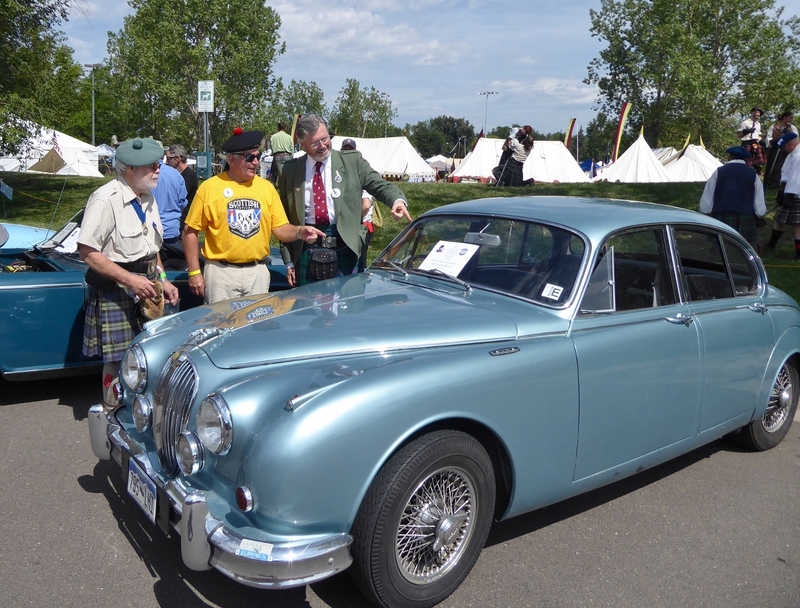 The weekend is a marvelous opportunity, not just for MG owners, but for sports car enthusiasts of every marque (British, American, German, Italian, Japanese) to come together for sunny days, cool nights, and unique events. The fun begins on Friday with the Tour to Glenwood Springs, which will take you through some beautiful scenery on the way to Glenwood Springs. Saturday’s main event is the more rigorous time-speed- distance rallye to challenge both novice and experienced rallyists, starting and finishing in Glenwood Springs, rallying through canyons and over mountain passes in the heart of the Rocky Mountains. Again, this year is a youth tour so that your kids will have their own tie-breaker questions to answer. Spend the day winding through the beautiful mountain valleys around Glenwood Springs. The weekend culminates with a social gathering Saturday night and the Car Show, Funkhana, and Awards Presentation on Sunday.